A couple items from Wisconsin. Menzie Chinn points out how governor Scott Walker, who claims a deficit to be the compelling reason for eliminating collective bargaining rights for public workers, also thinks the way to save money is to have government ignore cost vs. benefit analyses when making decisions. Actually, Walker doesn’t even want the analysis done in the first place. His mind is made up. Private contractors will always be cheaper in his eyes, and he doesn’t need any stinkin’ facts or analyses to get in the way. Here is something that struck me — as someone who teaches in a public affairs school with courses in policy analysis — as odd, particularly in a time when resources are limited. From the Milwaukee Journal Sentinel. Gov. Scott Walker’s budget proposal would eliminate a law requiring state agencies to study the costs and benefits of outsourcing work. That provision and others in the GOP governor’s 2011-’13 budget drew questions from both Republicans and Democrats at a briefing Tuesday before the Legislature’s budget-writing committee. Speaking to the Joint Finance Committee, Administration Secretary Mike Huebsch said that the law was cumbersome and required an analysis of contractor costs to be done even in cases where state workers couldn’t do the work. “We did a cost-benefit analysis on the cost-benefit analysis and found it was costing us money,” Huebsch told the committee. That analysis is definitely one I would love to see. (I am hopeful that the “we” in the passage refers to him and staff.) The article continues. Under Walker’s bill, the cost-benefit analyses would be retained only for engineering services at the state Department of Transportation. The proposed change drew questions from Sen. Luther Olsen (R-Ripon) and Rep. Tamara Grigsby (D-Milwaukee). Olsen said he didn’t want to burden state agencies with red tape but also wanted to make sure that agencies weren’t spending money unwisely in a time of tight budgets. “Can you explain why, when we’re in a time of serious fiscal trouble, we would not want to do a serious cost-benefit analysis? . . . When you are cutting government and cutting programs, you can’t afford to make mistakes,” Olsen said. In May 2009, a legislative audit found that the state Department of Transportation outsourced 125 construction engineering projects over 16 months even though it determined each one of them could have been done for less using state workers. Using state workers instead of outsourced engineers could have saved $1.2 million during that period, the Legislative Audit Bureau report found. State officials are often reluctant to hire more workers because of concerns that they will have to pay those costs for years into the future. Contractors, while sometimes more expensive, are paid on a project-by-project basis. For those interested in learning about CBA, see this collection. It’s a strange way to get more value out of government money. But then this is the same governor who thinks selling off state-owned assets without a competitive bidding process will get the best price for the state. In the same posting at Econbrowser, Chinn points out that the state government has chosen to defy a court judge, not once but twice, and go ahead with implementation of a law against the judge’s injunction. The state is preparing to spend thousands of dollars fighting the judge and appealing when all they really need to do is pass the law in the legislature again, only this time conforming to the state’s open meetings law. It’s not about the state deficit in Wisconsin. It’s about power and cronyism. It clearly isn’t about the rule of law. Pity the Rich and Powerful – Won’t You Help? 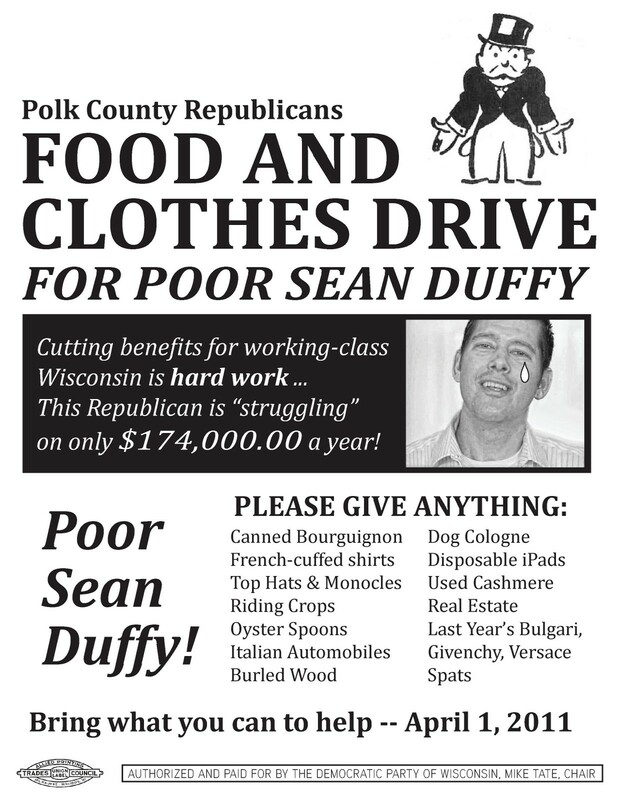 Hugh Pickens at Slashdot reports how a Wisconsin Congressman has been complaining that it’s tough to make ends meet on his meager $175,000 congressional salary (complete with extensive benefits including healthcare, defined benefit pension, paid staff, etc). But once a video got out of him complaining about his low pay (which is more than 3 times the average of the people he represents), it seems the Republican party in his home county want to recall the video and threaten anybody who shows it with copyright infringement. Pity the Rich. It’s So Hard to Get By. A couple of items that remind me of the discussions last year about tax cuts. The major bone of contention in last December’s tax cut deal was over whether the Bush era tax rate cut for the top income bracket should be extended. You may remember that it the Bush tax cuts were originally scheduled to expire January 1, 2011. But Republicans in Congress refused to renew extended unemployment benefits for the unemployed unless the tax cuts for the upper income bracket was extended. The top bracket starts taxing income above $209,000 (married, file jointly) at 33% and 35% for income above $373,000. ( source). Note only income above these limits gets taxed at these rates. Income up to this limit pays lower rates like everybody else. The debate was partly framed as a question about whether “the rich” should pay higher taxes. At the time there was a lot of complaints from people who were in these brackets, making this kind of money. They complained that they were “not rich”, they certainly didn’t “feel rich”, and that they too had a “hard time making ends meet.” What they didn’t understand is that “rich” is a relative term. It’s how much money you make (or wealth you possess) relative to everybody else. It is not a question of whether you “have everything you want” or whether you can manage your budget to make sure expenses are less than your income. Everybody has that problem with the possible exception of those religious types that have managed to totally transcend their human material wants. 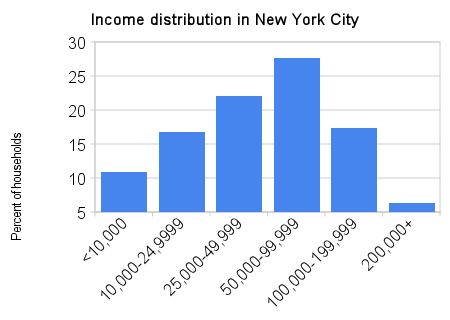 Others claimed that somehow “living in New York/Beverly Hills/Washington means that a high income isn’t rich. I even had a lobbyist for the insurance industry try to tell me in a televised debate that people making $250,000 in Beverly Hills were not rich. But it is. The plain truth is that very few people make that kind of money. Yes, $250,000 isn’t much if you compare yourself to Wall St. execs that pay themselves more than $20 million per year. But you’re still rich compared to the entire population. Arguments over income taxes tend to get bogged down in arguments about who is really “rich.” And what you hear then is that rich in Ohio and rich in New York City are different. But how different? According to the Census Bureau, only 6.3 percent of New York City’s households pulled in more than $200,000. So if you’re a household making $250,000 or more, you’re easily in the top 5 percent — even in New York City. Now, it’s true that those people might not “feel” rich. There’s lots of stuff to buy in New York City. It’s pretty easy to construct a lifestyle where you spend $250,000 a year. In Columbus, Ohio, only 1.3 percent of households make more than $200,000, so there’s less stuff for them to buy and fewer rich people for them to try to keep up with. But what you buy and whether you try to keep up with the people in the penthouse is a personal decision, not an objective economic necessity. The fact of the matter is that a household making $250,000 in New York City is making more than pretty much anyone else in the city. Being rich is more than just a feeling. Yes, even in New York City. A joint household income of over $250,000 is rich. It puts you in the top 5%. That means for every household with more money, there are 19 with less. A lot less. Nationwide, such an income puts you in even more rarified company because more rich people live in New York. There was no reason to cut taxes for these people. Note: No I am not hypocritical or simply jealous. My spouse and I, both being college professors, easily make a combined income that reaches into very low 6 figures. That makes me rich. We’re in the top 10% or so and we know it. David Cay Johnston reported this a few weeks ago and I almost missed it. It’s particularly relevant, though, what with official Washington talking about how to cut spending, restrain the deficit, etc. (at least attacking the English language with euphemisms about war in Libya). We don’t have a revenue problem. We have a spending problem. — Senate Minority Leader Mitch McConnell, R-Ky.
Washington does not have a revenue problem. It’s got a spending problem. — House Majority Leader Eric Cantor, R-Va.
— House Budget Committee Chair Paul Ryan, R-Wis. I think it’s not a revenue problem; it’s a spending problem. As framed, these advertising lines are matters of opinion, but how many Americans recognize them for what they are — opinions, not facts? When these people talk about taxes at all, they claim that tax rate cuts actually raise tax revenues and grow the economy. Unfortunately the facts don’t bare that out. In fact, tax rate cuts result in lower tax revenues. In plain terms, tax rate cuts create deficits. If you add a recessions to the mix, you get even lower tax revenues and bigger deficits because unemployed people don’t pay much tax. Johnston points out, using officially released data, that we’ve had an excellent test of this assertion that “tax rate cuts grow the economy and create more tax money”. In 2001, at the beginning of the last decade, the Bush administration pushed through a very large cut in tax rates for both high-income individuals and for corporations. I’ve already mentioned how this has allowed General Electric to avoid paying taxes despite billions in profits. But that’s just one corporation, albeit a very large one. How have people overall done? Are we over-taxed as the TEA Party folks claim? Have taxes been rising? The answer is a very clear: NO. Despite real GDP being 17.62% higher in 2010 Q4 than in 2000 Q4., total federal tax revenues are down. That’s why we have a huge deficit. Federal tax revenues in 2010 were much smaller than in 2000. Total individual income tax receipts fell 30 percent in real terms. Because the population kept growing, income taxes per capita plummeted. Individual income taxes came to just $2,900 per capita in 2010, down 36 percent from more than $4,500 in 2000. Total income taxes and income taxes per capita declined even though the economy grew 16 percent overall and 6 percent per capita from 2000 through 2010. Let me repeat that. Individual income taxes per person in the U.S. are down 36 percent in 2010 vs. 2000. Now you may be skeptical. You may be thinking, I dont’ think my taxes are down. You may be right. That might be because you’re in the lower 1/3 or so of income earners who only pay payroll taxes (Social Security, Medicare) but don’t pay income taxes. You can’t pay lower than zero. The people who pay the bulk of income taxes got the rate cuts. Did they respond with such increased effort that incomes rose and they still pay more tax dollars at the lower rate (this is what Laffer-curve oriented Republicans claim)? No. They pay less tax now. But it wasn’t only high income individuals who benefitted from the generosity of Bush and the Republicans in 2001 (and again by both parties in 2010), corporations also benefitted. In particular, large multi-national firms benefitted. So what happened to the tax revenue they pay? Corporate income tax receipts fell 27 percent and declined 34 percent per capita, even though profits boomed, rising 60 percent. Johnston does note that payroll taxes, the taxes that workers pay for Social Security and Medicare did increase during the decade. But these are taxes paid by all workers on income up to only $106,000. The same politicians who falsely claim that income tax rate cuts increase revenues are in fact trying to use the deficits created by too-low income tax revenues as an excuse to cut Social Security benefits for those very workers who stepped up to the plate and paid their taxes. It’s been said often that the “first casualty when war comes is truth”. If so, then surely the second casualty of war is the English language. The Pentagon, White House and State Dept have long butchered plain language and favored the use of euphemisms. We long ago learned that it’s not really civilians that get killed, it’s “collateral damage is incurred”. Now with President Obama’s and NATO’s attempts to spend money blowing things up in Libya so that we can’t spend the money at home where it might create jobs, the same people are falling over themselves to invent new terms to describe what’s happening. We must, it seems, at all costs avoid using the words “war” or “attack”. The terms they’ve used though are about as muddy and unclear as our objectives in Libya. For the full effect, I recommend watching the March 29, 2011 episode of the Daily Show With Jon Stewart. The segment is the first one and it’s long but worth it. You can find it at the link – warning, link plays audio and commercials automatically. The best, though, is Stewart’s suggestion that instead of a “turd sandwich” as one analyst called it, we refer to it as “Bread-Based Feces Containment Operation”. Yes, a BBFCO. We are too civilized to attack and go to war. We do BBFCO’s. * I’m astounded the Admiral could say it repeatedly with a straight face. What’s Kinetic Military Action mean? Have we ever fought a war that wasn’t “kinetic”, where we just stood still? Is it possible to have a Kinetic Military Inaction?